Usually, I dedicate one layout to Trevor's Halloween costume and a second layout of him trick-or-treating with his friends. This time I combined the two. I didn't really have anything to say about Trevor's costume: I'm not into Star Wars, I did absolutely nothing creative for his costume (except using my Crop-a-Dile to punch a hole in the belt to make it small enough for him to wear), and I didn't get tons of great photos of him in his costume. Steve and I dressed as Civil War soldiers because it was easy and fun. It was the first time we dressed up in something that didn't coordinate with Trevor's costume. I mentioned that in my journaling, but it didn't need an entire page on its own. 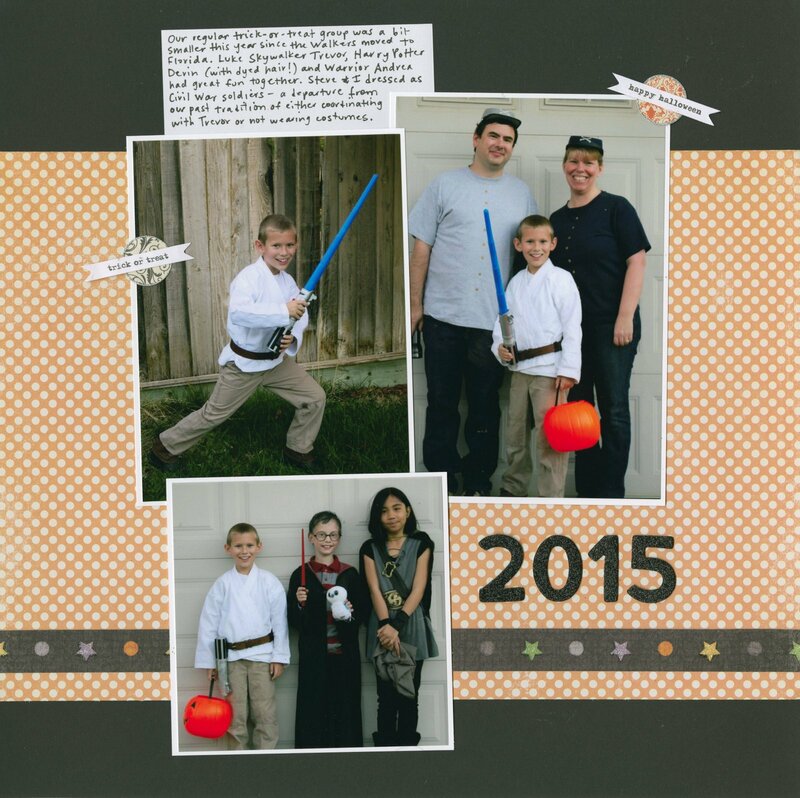 I also mentioned in the journaling that our trick-or-treat group was smaller, since Trevor's best friend moved away. Nine years of Trevor celebrating Halloween scrapped! I am loving this! LOVING how you combined the photos from the day!!!!!!!!!!!! Love the paper and the border strip! PErfect for this! The layout looks great regardless of the different themed costumes... Most likely because you kept the BG a "generic" (hate that word it sounds negative but I'm sure you know what I mean) Halloween color and the embellishments light. I love the journaling peeking out at the top; I'm always interested in seeing how others incorporate journaling into a "clean and simple" layout! BTW - I don't care for Star Wars either. I also think they're boring! The only one I've actually made it through is Episode 3, I think that's what it's called, the where Darth Vader becomes "Darth Vader" I found that one interesting... because I love origin stories! The others I have seen, only 2 others, I fell asleep during both of them! Your journaling is what really makes it special. 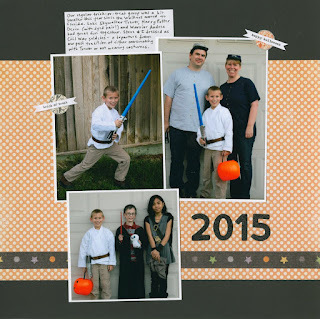 I absolutely love your scrapbook pages and this one is no exception. It is always apparent how much thought you put into your work. I especially like the special photos and your wonderful journaling! Awesome. I really need to get to scrapbooking my kiddos pics. Love the costumes.